The Civil War had very little to do with slavery. Well, at least that is talking point spewed by nearly 1,000 historical revisionists that descended upon downtown Montgomery, Alabama on Saturday. The group of Confederacy worshipers raised the rebel flag on the capitol lawn and had a mock swearing-in of Jefferson Davis. As the fake Davis sashayed up to the podium, some of the pro-Confederacy crowd bellowed, “God bless you, Mr. President” and “Long live Dixie”. Like today’s social conservatives, the Confederate crowd tried to play the victim. According to The Advertiser, Lt. Commander in Chief Kelley Barrow compared his movement’s alleged persecution to that suffered by civil rights icon Rosa Parks. These poor misunderstood victims. How will they go on and survive in such a hostile climate? 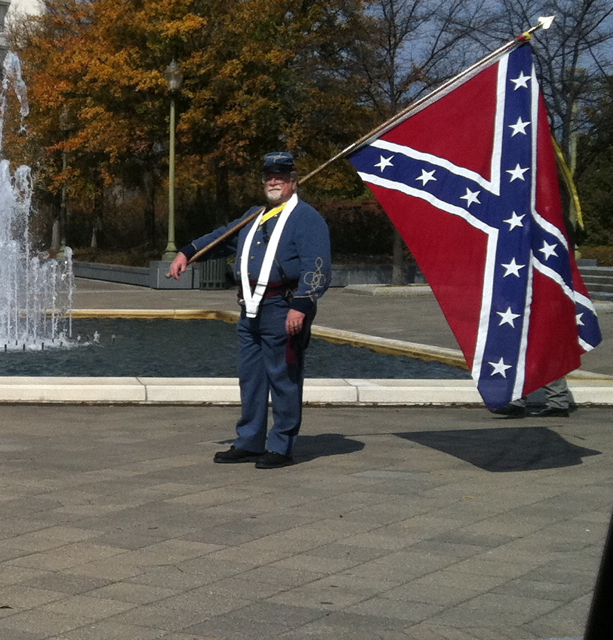 I happened to be in Montgomery for Truth Wins Out’s “Winter Tour” and witnessed this unpatriotic disgrace. The participants were in severe denial about what they called, “The War of Northern Aggression”. “People today aren’t educated about the war and since history is written by the winners, the truth may never by told,” Robert Bentley of Muscle Shoals told The Montgomery Advertiser. If it were only so simple. Unfortunately, the losers have been writing countless tomes attempting to spin and justify the grotesque bigotry of the Confederacy. I personally overheard several people make the inaccurate claim that the Civil War was not about slavery, but state’s rights. Cute. In reality it was about state’s rights — in so much as the southern states wanted the right to continue the sickening slave trade. If anyone doubts that slavery was central to the Civil War, skip all the propaganda and go right to the secession resolutions in state’s like South Carolina. The facts don’t lie. The evidence is simply too overwhelming and robust to come to any other conclusion. Yet, the local newspaper, The Montgomery Advertiser, repeated the lie that the causes for the war were inconclusive. The reasons for the Civil War have been widely debated, with the controversy surrounding the event Saturday due to the war’s connection to slavery. Truth be told, the Civil War was about buying and selling human beings. The people who defended this moral abomination are not chivalrous, nor honorable. 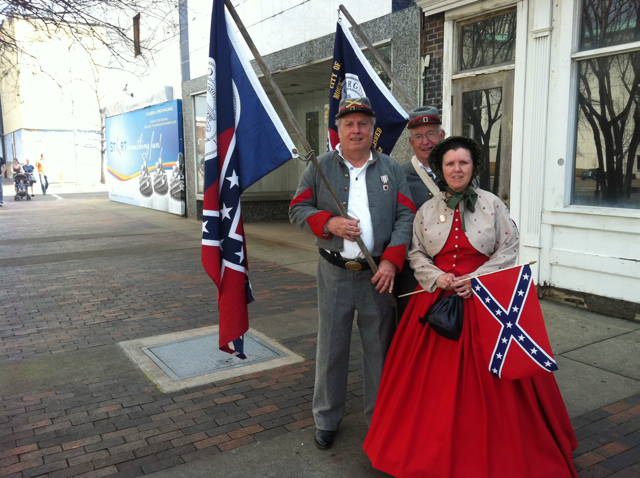 Those who defended the Confederacy were traitors whose heritage includes the deep stain of slavery and Jim Crow. Such a legacy is nothing to celebrate. The people at the rally should, instead, bow their heads in shame and sorrow for instigating a war that killed tens of thousands and supported bigotry of the most heinous kind. When you hear conservatives talk about “state’s rights” in the context of LGBT equality — never forget where this ugly refrain came from. 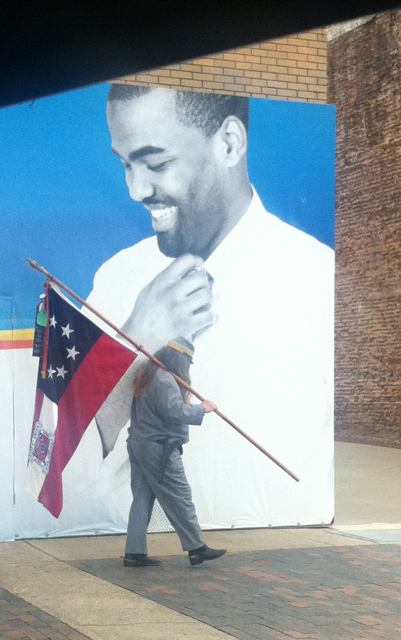 I just love how in this photo the successful black professional is smiling down on the defeated, un-groomed Confederacy fan. I think this picture captures why these people are living in the past. In the old days, the white guy would hold power over this black man, by virtue of his color. Now he must compete with him for jobs and status. And, judging from this picture, who would you rather hire or have a drink with?